Rafael Nadal gored YouTuber Stefanos Tsitsipas 6-2, 6-4, 6-0 today. 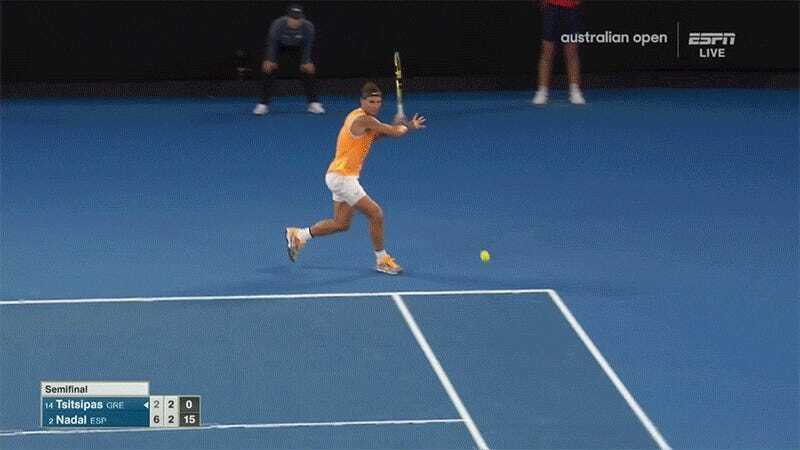 Their Australian Open semifinal match took just 1:46, but in that span the winner erected a monument to one of tennis’s historic shots: the Rafa banana forehand. Above is as pristine a specimen as has ever appeared in nature. Here are the general conditions for the banana. The opponent has hit a ball into the ad-court, so fast that any shirt-sleeved right-handed coward would have just allowed the winner on sight. It’s coming cross-court at an angle that will yank Rafa all the way off the baseline. The Spaniard is sprinting (or, surface permitting, skidding) out past the doubles alley to intercept it. You don’t even have a chance to wonder if he’ll get there. Because abruptly the feet are no longer the spectacle—it’s the lashing left arm, coming up and around the ball to give it occult shape. Somehow the ball is headed back with so much side spin that it bends in the air—hence the banana—around the sideline, maybe even around the net post; and with so much top spin that it dips right down to kiss the opposing corner. Only the fastest players could do chase down the ball, and only this damn spin djinn could massage it into the perfect landing spot. He makes your winner his winner. It’s his signature, both sickening and majestic. Tsitsipas hit as pretty a cross-court angle as he could have, but Rafa just found it and returned to sender at 92 mph. The ball screamed in between the net post and the ump’s chair. It never looked like it could land inside the paint until it did, fooling the observer just the way all the best bananas do. In the next set he hit banana number two. This time, right off a serve—and not any serve, but one he actually misread. That initial step out in the wrong direction sent him into scrambling banana mode all over again, a mistake that has benefited YouTube posterity. Note to John McEnroe: this is the only good way to appreciate Rafael’s banana in public. More of this and less of the voyeuristic ogling you tried to pull off court today.